A recap of the RAPID + TCT 2018 conference. The XJet Carmel 1400 AM System uses the company’s NanoParticle Jetting technology. Image courtesy of XJet. The Rapid + TCT 2018 conference and trade show, produced by SME, took place April 23-26 in Ft. Worth, TX, with a focus on closing the 3D printing knowledge gap and accelerating the adoption of additive manufacturing. 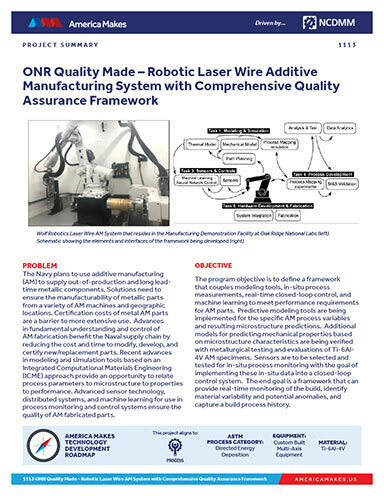 Before the April 24 keynote, Michael Grieves, the executive director of the Center for Advanced Manufacturing and Innovative Design and a professor at the Florida Institute of Technology, introduced one effort to close that gap: the ITEAM (Independent Technical Evaluation of Additive Manufacturing) Consortium. The SME platform is being developed and tested by the ITEAM consortium in collaboration with Grieves, GM and other major industry users in automotive and aerospace. It is developing a methodology called SAM-CT (size, accuracy and materials + economic evaluation of cost and throughput) to help would-be additive manufacturing users identify when and where the technology would be suitable. On the people side of the knowledge gap, Stratasys and a consortium of colleges and universities announced a new industry certification program in North America just before RAPID that is intended to enable students to prove their additive manufacturing workforce readiness. Learn more about the certification program here. Behind the stage curtain where Grieves presented his RAPID address, more than 300 exhibiting companies were ready to explain how their products and services would advance the additive manufacturing efforts of the 6,000+ attendees. Stratasys PolyJet is being used by award-winning stop-motion animators at LAIKA to ensure naturalistic facial animation for its puppets. Image courtesy of Stratasys. In addition to the certification program, Stratasys launched the new F900 Production 3D Printer, the third generation of the company’s flagship FDM system. Features include an MTConnect-ready interface with production-ready accuracy and repeatability, according to the company. It is available as a series of three solutions: the F900, the F900 AICS (Aircraft Interiors Certification Solution), and the F900 PRO. Stratasys also expanded the number of 3D printers compatible with carbon fiber composite material, demonstrated enhancements to its GrabCAD Print software, previewed Jigs and Fixtures for GrabCAD Print software and demonstrated its Stratasys J750 3D Printer alongside the new Stratasys J735 3D Printer. Now offering in excess of 500,000 color combinations via a new vivid color package, the PolyJet-driven J750 and J735 systems create prototypes that look, feel and operate like finished products, according to the company. Learn more here. DWS Systems gave a preview of its industrial-grade, large-format XPRO S 3D printer at the show. The stereolithography printer is priced at $132,000 and is expected to be available this month. The quad-laser XPRO S has a 300x300x300mm print area, according to Daniela Lavezzi, business development and key account manager for DWS. Sixty different resins are available for the industrial 3D printer, including rubber-like and transparent materials, as well as nano-ceramic resins. Learn more here. 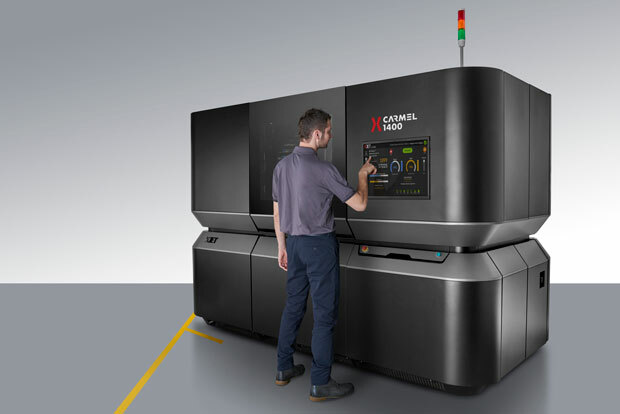 Speaking of ceramics, XJet demonstrated its Carmel AM Production System at RAPID. The 3D printer uses NanoParticle Jetting (NPJ) technology to print separate nanoparticle “inks” or fluids for the build and support materials. This allows manufacturers to produce ceramic or metal parts with complex geometries. Days after the RAPID event, the first XJet Carmel 1400 installed in the U.S. was on display at its new home in the Youngstown Business Incubator in Ohio, just across the parking lot from America Makes during a May 1 open house. Learn more about XJet, including its founding team’s roots in Objet, here and here. XYZprinting, widely known for its daVinci line of low-cost 3D printers, and Nexa3D jointly previewed their MfgPro220 xPF 3D industrial printer at RAPID. The MfgPro220 xPF 3D printer is powered by what the company calls Lubricant Sublayer Photo-curing (LSPc) technology and a patented structured light matrix that increases throughput. It relies on deep machine learning algorithms to slice, optimize and adaptively compile complex geometries at uniform speed and high-resolution, according to the company. The MfgPro220 xPF is configured to run using both on-board and cloud controls for in-situ and remote operations of a single printer, or a full factory of printers to enable mass production of customized parts. The $19,950 industrial printer is expected to be available for sale in November 2018. Learn more here. EOS launched its P 810 polymer platform that is designed to process the new high-performance, ALM material HT-23 that was developed with Boeing. With a build volume of 700x380x380 mm and two 70-watt lasers, the EOS P 810 system enables the production of large structural parts with dimensional accuracy and increased productivity. Learn more here. EnvisionTEC announced its E-RigidForm material by displaying a 328-ft. chain that was 3D printed in the new material. Designed by EnvisionTEC 3D Builder Robert Montes (upper left and lower right), the chain features 6,144 links, each measuring 1.5 in. The print job was processed with support from colleagues Erica Finkowski (lower left), Josue Nunes (upper right) and Jason Spurlock (not shown). Images courtesy of EnvisionTEC. Learn more. 3D Systems demonstrated a range of solutions, from the Figure4 production system to its entry-level FabPro 1000, which includes the company’s 3D Sprint software. The Figure 4 is a modular system that can be used as a standalone industrial-grade 3D printer or scaled to combine multiple print engine modules with a user interface module and post-processing module. The standalone Figure 4 is expected to be available in the third quarter of this year and cost less than $25,000. 3D Systems also announced more than 30 materials for the Figure 4 at RAPID. 3D Systems’ booth also included the ProX SLS 6100 and the sub-$5,000 FabPro 1000 that were introduced late last year. The FabPro 1000 is expected to be available this month. Learn more here and here. A number of entry-level fused-filament systems were on display at RAPID 2018. Many of the companies demonstrating them rose during the consumer 3D printing boom and survived the bust by shifting to target the prosumer and professional 3D printing market. Ultimaker unveiled its new S5 3D printer, which will be available May 15 for $5,995. It has an updated touchscreen, multiple build plates, improved auto leveling and a larger build volume (13x9.5x11.8 in.) when compared to the Ultimaker3. It also has a more enclosed build environment and can print with a wider range of materials, from PLA to advanced engineering plastics like Nylon and PC. Learn more here. The Ultimaker S5 features integrated hardware, software and materials configuration, as well as optimal settings alignment. Image courtesy of Ultimaker. Raise3D showed off its Pro2 Series, a new line of printers that includes the $3,999 Pro2 and the $5,999 Pro2 Plus that has a 12x12x23.8 in. build volume. MakerGear introduced an upgrade to the M3 3D printer it launched at RAPID last year. The M3-ID Rev. 1 includes a touch probe for print bed leveling and also checks the print surface to generate a mesh using nine data points to compensate for any unavoidable variations in the flatness of the print bed, according to the company. An optional enclosure is also available. Fusion3 Design launched its Fusion3 F410, the successor to the company’s F400 3D printer. Available now for $4,599, the F410 features a new 2.0 extruder, updated 32-bit controller, interchangeable printheads, automatic bed leveling and a 14x14x12.4-in. build volume. Aleph Objects, makers of LulzBot 3D Printers, previewed its LulzBot Mini 2 Desktop 3D Printer that is expected to start shipping to customers in June. The Mini 2 includes as standard three accessories previously offered as add-ons to the original LulzBot Mini: an Aerostruder Tool Head designed around the E3D Titan Aero hot end and extruder, the LulzBot modular bed system with reversible heated glass/PEI surface and a graphical LCD controller for tetherless operation. Learn more. M3D, LLC launched its Crane Quad 3D printer, a multimaterial desktop 3D printer that starts at $399 and promises more than 50,000 colors by mixing up to four colors of standard 1.75 mm filament. Learn more here. Metal additive manufacturing news was hot at RAPID—from Desktop Metal’s Studio System, which is expected to be generally available in the US this year, to Markforged’s announcement that its Metal X 3D printing systems is shipping to customers and resellers. Plus, Digital Metal announced it is expanding its operations to support serial manufacturing of its DM P2500 binder jetting metal 3D printer and new components. The Arcam EBM Spectra H system. Image courtesy of GE Additive. GE Additive used the event to unveil the Arcam EBM Spectra H, a new metal additive manufacturing system designed to handle high-heat and crack-prone materials. The Arcam EBM Spectra H complements the company’s existing electron beam melting systems. Initially, the Arcam EBM Spectra H will support both TiAl and Alloy 718. Additional Ni-super alloys will be supported from 2019. The new system is available to pre-order, with expected delivery from Q4 2018 and after. That’s just a small amount of the news coming from RAPID + TCT 2018, so you can see why end users are struggling to keep up. In addition to initiatives like ITEAM and certifications, the industry is turning to software to help advance additive manufacturing. For example, ANSYS has launched its ANSYS Additive Print and ANSYS Additive Suite to deliver solutions for metal additive manufacturing. The software is intended to enable users to print lightweight complex metal parts successfully the first time and analyze microstructure properties and behavior. These new ANSYS solutions are said to help limit design constraints, reduce waste and shrink print time. Learn more here. Siemens demonstrated its new additive manufacturing network that is expected to rollout this summer. It is intended to create an open ecosystem in which part buyers and manufacturing service providers can benefit from streamlined collaboration, quoting, procurement and order monitoring processes. Learn more here. Jabil introduced its Jabil Additive Manufacturing Network that it says will drive greater manufacturing speed and agility while helping customers improve how they design, make and deliver products. The cloud network empowers customers to move manufacturing workloads to regions and into markets that make the most business sense and enable easier product personalization. “Prototyping is mature, so we’re focused on production,” said John Dulchinos, VP, Digital Marketing for Jabil. “There’s still a clear gap between the two. You’re still not able to print, pack and ship with a manufacturing rigor that allows you to trust repeatability. That’s what we’re producing.” Learn how Jabil teamed up with HP here, read more about its network here and explore its vision for the future of manufacturing here. AddUp, the result of a joint venture between Michelin and Fives Group to share their additive manufacturing and production, outlined its services at RAPID. The company can assist with additive manufacturing machine design and production, metal part production, re-design of parts, and other services to help industrial companies find the right additive manufacturing technologies. Protolabs was on hand at RAPID 2018 to share the news that it recently purchased a new manufacturing facility in Brooklyn Park, MN, to expand its prototyping and low-volume production capacity. The company has also recently invested in additional manufacturing equipment for both its American and European facilities to support business growth. With a dizzying array of additive manufacturing processes, organizations and technologies that can help users create an efficient end-to-end workflow are critical to additive manufacturing fulfilling its promise. The industry is moving beyond equipment “speeds and feeds” to focus on integrated solutions that combine hardware, software and materials to solve specific prototyping, tooling and manufacturing challenges. 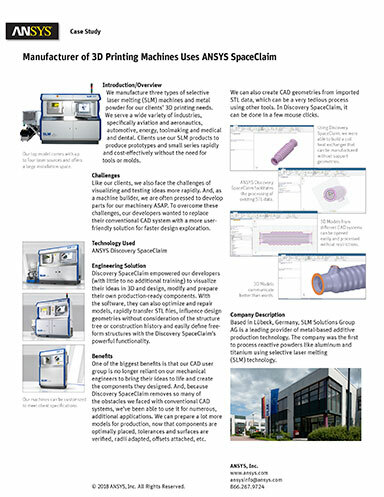 Read more additive manufacturing news here.